Tsering Dolma is one of the poorest people I’ve ever met. In a world that measures wealth by money, she has next to none. The UN sets the poverty standard at two dollars a day. I’ll bet that Tsering Dolma doesn’t have two dollars a week. Paradoxically, Tsering Dolma is also one of the richest women I’ve ever met. Walking her fields of barley, peas and carrots, cooking dinner in the house that has served 10 generations, cutting her vegetables by the generous stream that flows through her property, she lacks NOTHING. Meeting Tsering was the culmination of a three-year long promise that was extracted from me by her daughter, Stanzin Changchub. I first started corresponding with Stanzin via email, introduced to me by Wasantha, a mutual friend. I was struck by how OPPOSITE her life was from mine… she lived literally on the other side of the world, in the Himalayan country of Ladakh. And, as I found out, her mother lived even further. 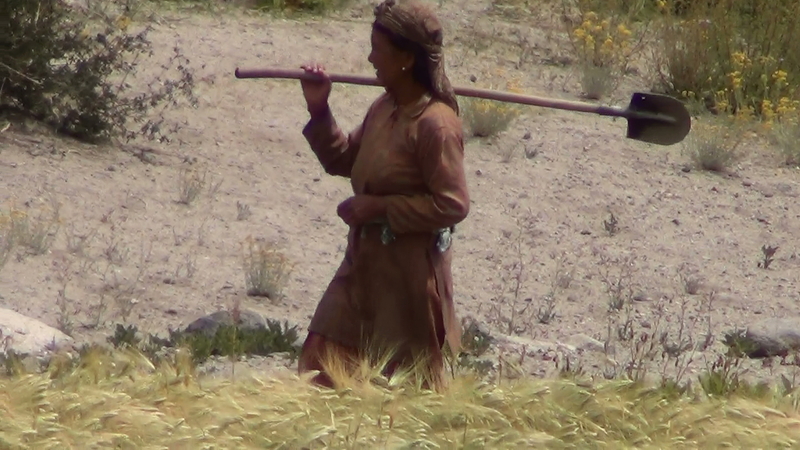 The plateau is terraced into various fields, each field planted with what would sustain Tsering, her son and her animals for the long, cold winter in the mountains. No one knows why the first people settled in that area. What called them? Tsering guesses that at least 10 generations have lived on that spot. Perhaps more. Ten generations of people. Ten generations of animals – cows and dzou’s, the cross between yaks and cows. A few hundred years of the same barley and peas being planted and harvested, year after year generation after generation. This is “genetic manipulation”. Give your food a few hundred years to get to know you – and vice versa. Give your food enough time to fall in love with you. Why are you in such a hurry? This is also radical sustainability. This is spiritual sustainability – to know one’s place in the Cosmos, to live one’s life fully, to live one’s life well, to know where your children were born and where you will die. Make no mistake – Tsering Dolma’s life is hard. 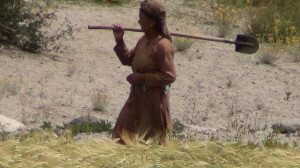 She’s up at 5:30am every day, climbing to the Buddhist shrine at the top of the hill for prayers and offerings, fixing meals, tending crops, planting, harvesting… She takes it all at her own pace, never rushes, always has time to pause to check out the weather, or look at her fields. Or talk to me. She doesn’t know a word of English, and doesn’t seem to grasp (or care) that I can’t understand a word of Ladakhi. Most of us in the West work for money, so that we can buy “labor-saving devices”, then work for MORE money, so that we can buy a membership in a gym, so that we can rent “labor-extracting devices”. Tsering gets to skip all that. I watched her washing her clothes, then washed my own, in water that was ice just a few minutes before. My hands were numb from cold in just a few minutes. I was panting from exertion after wringing out my pants. Tsering gave me a look that seemed to say, “What exactly is your problem? One of my most pleasant experiences in recent memory: Sitting on a rock by the stream, drinking fresh, cold (unfiltered) mountain water, watching white butterflies chase each other through the barley fields, watching Tsering squatting a few feet away, cutting up the vegetables that would go into our lunch, chattering away at me, handing me fresh pea pods to eat, waving her knife toward the fields to emphasize some point… I realize that I am HAPPY. Not “happy” as in “well entertained”, but “happy” as in “fulfilled”. At that moment, I want for nothing. It is in that moment that Tsering Dolma lives her entire life. In that moment, a lot of work gets done. But, there really is no “doing”. There is an effortless flow of energy in, energy out, a dance of simplicity. A big part of Tsering’s life is connecting with the trekkers who make it that far up to Dok River Canyon. For those who make it, Tsering’s house is the first they encounter. And what they encounter is the legendary hospitality of Ladakhi villagers. On my first day there, two people came in – a woman from England and a local Ladakhi guide. 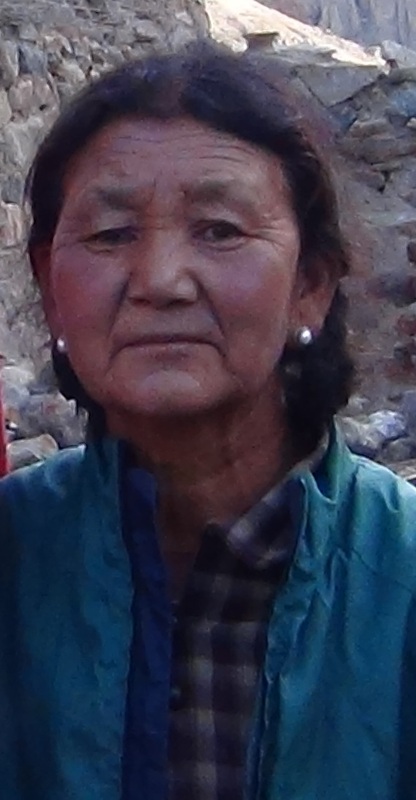 The woman was a professional tour guide and experienced trekker, having just climbed Mt. Kilimanjaro in East Africa a few months earlier. And SHE said that she was wiped out… that the Path to Hunder-Dok had taken all of her energy. (Made me feel less like a wimp!) She stayed for several hours, while Tsering watered, fed, tea’d and otherwise made us feel like long-lost friends, returning home. What she offers to trekkers: Stay as long as you like. Eat and drink as much as you like. Leave some money, but only if you want to. She does this, not because it makes her MONEY, but because it makes her HAPPY. This is the “Economics of Happiness” in action. I think it’s safe to say that Tsering Dolma’s actions are motivated by METTA, the notion of loving-kindness. She loves us, and that love takes the form of caring for us, even though we are total strangers. Is feeding a stranger or tending to their needs a form of “love”? Jesus thought so, and so do I. In our culture, we tend to give out hugs and warm fuzzies, but skip the parts about meeting basic needs. 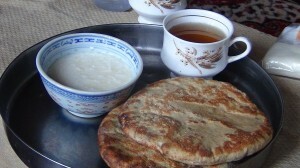 “morning tea”, followed by breakfast: thick, heavy barley cakes, with either yogurt, curried vegetables, or butter and jam. With more tea. The next morning, I manage to eat one and a half cakes. She seems happier. Is feeding someone an act of love? You bet it is. It’s a demonstration of love and caring that I didn’t understand from my own mother until I was an adult. So, thank you Tsering Dolma. And, thank you, Mom. 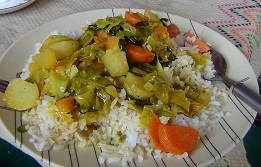 I started out saying that Tsering Dolma is “poor”, according to the United Nations. They measure things in terms of money. Tsering Dolma doesn’t need money. At least, not much. Yes, that’s right. Ms. “Less-Than-Two-Dollars-a-Day” Tsering Dolma has SO MUCH, her main focus is in how much she can GIVE. She is the very definition of wealth. This, to me, is the essence of “The Economics of Happiness”. This entry was posted in Blog: Currents & Futures, Sacred Civilizations: The Journal. Bookmark the permalink. Thank you Sharif, and beautifully said and seen, as usual. For me, this is the kind of life I crave – one of meaning in every moment, and one of not wanting, but being. I appreciate the beautiful picture you have painted for us. One that has always existed, but often forgotten. Dear Sharif (The Noble), it was great pleasure listening to your experience in person; but even greater pleasure to go through it in written form.Wishing you all the best for your safe return from the cave(s)………. Much aloha to you Sharif. I recently acquired a small figure, carved in raindeer antler, known as an “inuksuk”. It is widely used by the Inuit for landmarks and navigation. The meaning is “to act in the capacity of a human being”. This story gives so much meaning to this for me, and I wear this figure to remind me of the deeper meaning of being human. Tsering Dolma is a great teacher. Thank you so much, Sharif, I am breathing this deeply through our one heart and what an inspiration! To live life as Rumi’s guest house as does Tsering resonates fully. The box is full of salmon, and a man sits atop the box. Long ago this man hired armed guards to keep anyone from eating his fish. The many people who sit next to the empty river starve to death. But they do not die of starvation. They die of a belief. Everyone believes that the man atop the box owns the fish. The soldiers believe it, and they will kill to protect the illusion. The others believe it enough that they are willing to starve. But the truth is that there is a box, there is an emptied river, there is a man sitting atop the box, there are guns, and there are starving people. Given the ubiquity of this culture’s destructiveness as well as its technological capacity, there has never been a more important time to ask Ruth Benedict’s question: Why are some cultures “good” and others not? Benedict found that good cultures, which she began to call “secure,” or “low aggression,” or “high-synergy cultures,” could not be differentiated from “surly and nasty” cultures on the basis of race, geography, climate, size, wealth, poverty, complexity, matrilineality, patrilineality, house size, the absence or presence of polygamy, and so on. More research revealed to her one simple and commonsensical rule separating aggressive from nonaggressive cultures, a rule that has so far evaded implementation by our culture: the social forms and institutions of nonaggressive cultures positively reinforce acts that benefit the group as a whole while negatively reinforcing acts (and eliminating goals) that harm some members of the group. The social forms of aggressive cultures, on the other hand, reward actions that emphasize individual gain, even or especially when that gain harms others in the community. A primary and sometimes all-consuming goal of members of these cultures is to come out ahead in their “dog eat dog” world. Another way to put this is that social arrangements of nonaggressive cultures eliminate the polarity between selfishness and altruism by making the two identical: In a “good” culture, the man atop the box from the parable above would have been scorned, despised, exiled, or otherwise prevented from damaging the community. To behave in such a selfish and destructive manner would be considered insane. Even had he conceived such a preposterous idea as hoarding all the fish, he would have been absolutely disallowed because the box was held at the expense of the majority, as well as at the expense of future generations. For him to be a rich and influential member of a good culture, he would have had to give away many or all of the fish. The act of giving would have made him rich in esteem. But he would never have been allowed to strip the river. There would have been no fear with regard to the “gift” of fish, for social arrangements would have made him secure in the knowledge that if his next fishing trip failed, his more successful neighbors would feed him, just as this time he had fed them. It all comes down to how a culture handles wealth. If a culture manages it through what Benedict called a “siphon system,” whereby wealth is constantly siphoned from rich to poor, the society as a whole and its members as individuals will be, for obvious reasons, secure. They will not need to hoard wealth. Since this generosity is manifested not only monetarily but in all aspects of life, they will also not need to act out their now-nonexistent insecurities in other ways. On the other hand, if a culture uses a “funnel system,” in which those who accumulate wealth are esteemed, the result is that “the advantage of one individual becomes a victory over another, and the majority who are not victorious must shift as they can.” For reasons that should again be obvious, such social forms foster insecurity and aggression, both personal and cultural. Brian, a long reply, but definitely worth reading. She doesn’t know a word of English, and doesn’t seem to grasp (or care) that I can’t understand a word of Ladakhi. I can totally appreciate when people continue to speak to me in a foreign language after it’s clear I can’t understand. Incidentally: I just finished that chocolate bar you gave me, many moons ago! Melted in the Egyptian sun, broken into a million pieces… still tasted good! Thanks! You give such beautiful word pictures, as Ellen said. The wealth of happiness and meaning and service are what we all hunger for. And when someone shows up in our lives and demonstrates the practice, we call them “simple folk”. There is nothing simple about this goddess’s life. Or perhaps lifetimes of getting to know her plants and animals and various plots of earth and they getting to know her. All seem to get the same attention from her, and give it back. Pure beauty. How does one give that kind of attention back to her? Agreed. It takes decades, perhaps lifetimes of PRACTICE to make a life look this “simple”. I’m reading Thich Nhat Hanh’s “The Art of Power”. He talks about how mindfulness is a PRACTICE, not a THOUGHT. The more it is practiced, the easier it gets. The concept of continuity of purpose and practice through lifetimes is a new concept for me and one that has me very smitten. I don’t have to “get ‘er done” and in fact, can’t. Pressure off, devotion and dedication on. Thanks for voicing your dissent! Perhaps you are confusing my use of the word “hard”. For me, “hard” is not to be confused with “difficult” or “complicated” or “painful” or “suffering”. We all certainly know people whose lives are made difficult by living in a system full of rules, systems that don’t make any SENSE. That clearly is not what I mean by “hard”. The idea that life should not be hard is a mental model that exists only in taker culture. Wonderful again, Sharif. Thank you for the generosity of sharing this experience. Hope to connect again when you are back in Oregon. All blessings. Metta. Thank you for sharing your amazing journey to Hunder-Douk and to this gracious being, Tsering Dolma. I feel how much this is a journey you called yourself to, and it is a spiritual journey on many levels. I am drawing in deeply from what you have written and feel deep resonance with the truth in it. How happiness is available to us but like missing the “forest for the trees” we have blinded ourselves to the essence of joyful living, especially that daily immersion in the flow of nature, the giving and receiving of the earth and elements with us, the daily flow of work, and for Tsering, her demonstrating the same nature of love with any who cross her path…all are her neighbors! Outstanding…continued best wishes on your sojourn. Lovely, thoughtful, an inspired and inspiring reminder. What a beautiful story you have made of your encounter with the traditional Ladukhi culture. I’m so happy to know it continues much as did in the ’80s and ’90s when Helena Norberg-Hodge used to spend time there. I missed meeting Helena by a few days! There is the other story, though. In the cities, many of the young men and women are as “lost” as HNH describes them in her book “Ancient Futures”. And, I can’t tell what Leh, the capital city, looked like before the hordes of tourists descended on it. To this I aspire without expectation … yet with anticipation and more consistent glimpses of this presence … this simply happy nature. What a beautiful story, Sharif! I felt like I was there and now you understand better my need and pleasure on feeding people, whether I get paid or not :). I know exactly how she feels about the feeding others and the rewards in it. Thank you so much for sharing this with us! I can assure you… you’ve never fixed a meal as heavy as those barley cakes! Yes, Suzana! I had the same realization. Thank you, Sharif. Thank you. Such beautiful word pictures. I felt like I was there. This is a lovely and powerful story, Sharif of becoming life. Of being life. Thank you for taking the time to share in such a clear and eloquent way.